Above: After “The Cage of Love”, Hawick Lau reunits with Zheng Shuang in “Chronicle of Life”. 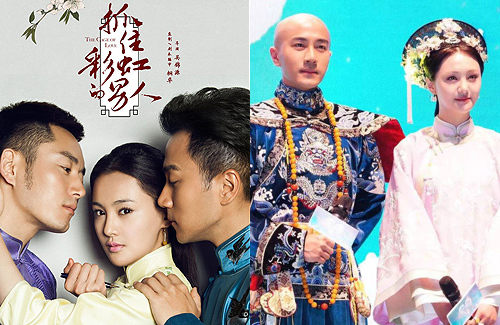 Dream Stardom China, a Zhejiang-based entertainment company, has a bevy of star-studded drama productions this year, including two TV series starring Hong Kong actor Hawick Lau (劉愷威) and mainland Chinese actress Zheng Shuang (鄭爽) as romantic leads. The first, The Cage of Love <抓住彩虹的男人>, will begin airing on May 25, while the second, Chronicle of Life <寂寞空庭春欲晚>, began filming in April and will be released next year. Chronicle of Life is a period drama based on a novel written by Fei Wo Si Cun (匪我思存), who is known for penning the story that was later adapted into Sealed with a Kiss <千山暮雪>, another of Hawick’s dramas. In Chronicle of Life, Hawick will portray Emperor Kangxi, while Zheng Shuang will play an imperial concubine in her first Qing Dynasty drama. Although Hawick has always placed much importance on his hair, he shared that out of all the historical figures, Emperor Kangxi is his favorite. As a result, he felt it was worth it to shave his head in order to take the role. Every time he has worked on a drama backed by Dram Stardom China, something fortuitous has occurred in Hawick’s life. For instance, Sealed with a Kiss lifted his popularity among mainland Chinese audiences, and he met his wife, Yang Mi (楊冪), when filming Ru Yi <如意> in 2011. Additionally, Hawick’s daughter was born during the filming of The Cage of Love, which was his first collaboration with Zheng Shuang. The series is set to air next month on Zhejiang TV and Dragon TV. Known for creating dramas like Best Time <最美的時光> and Perfect Couple <金玉良緣>, Dream Stardom China will continue its partnership with Internet writer Tong Hua (桐華), best known for writing the time-traveling novel Bu Bu Jing Xin <步步驚心>. One of the company’s most anticipated upcoming dramas is Destined to Love You <偏偏喜歡你>, whose storyline is helmed by Tong Hua. Expected to begin airing this summer, Destined to Love You boasts a cast featuring Hong Kong actor Bosco Wong (黃宗澤), Taiwanese actress Joe Chen (陳喬恩), and mainland Chinese actor Jia Nailiang (賈乃亮). The story tells of Qian Baobao (Joe Chen) and her attempt to assume the identity of a military instructor who later finds herself romantically involved with two of her fellow teachers. Jia Nailiang will also star in the Republican-era suspense series Housewife Detective <煮婦神探>, another Dream Stardom China drama that will begin airing in May. Like with Destined to Love You, the storyline of Housewife Detective will be handled by Tong Hua. This time, Jia Nailiang will star opposite his wife, Jacqueline Li (李小璐), marking their third collaboration together. Dream Stardom China also plans to adapt two more of Tong Hua’s written works. That Time of Youth We Cannot Return To <那些回不去的年少時光> will become a movie and a web drama, while That Starry Sky, That Ocean <那片星空那片海> is expected to become a movie and TV series, with hopes of landing William Feng (馮紹峰) and Angelababy (楊穎) for its lead roles. Dang! I love Fei Wo Si Cun’s tragic novels but why Hawick Lau? He’s typecasted in this kind of characters all over again. No breakthrough just simply mediocre actor! I’m sure he will be very greatly compensated for his awesome head of hair…. What hair? he has to shave for the ugly Manchu hairstyle.